Paramount dogs that assisted with post-Idai cyclone relief. Johannesburg. 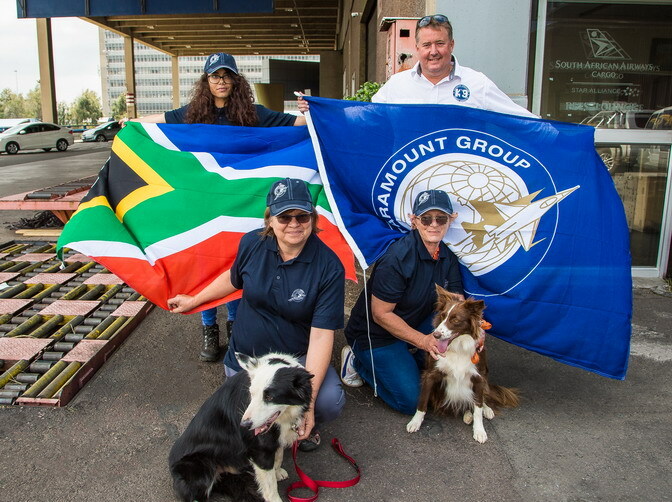 9 April 2019 – Paramount K9 Solutions, subsidiary of Paramount Group, the South African-based global aerospace and defence company, announced that the specialist K9 Search and Rescue Units that it deployed to disaster-stricken areas of Eastern Zimbabwe, have returned home to South Africa after playing a significate role in rescue and recovery operations amidst the aftermath of Cyclone Idai. Cyclone Idai, which the United Nations has described as “…one of the worst weather-related catastrophes in the history of Africa”, has claimed the lives of at least 200 people to date in Zimbabwe, with 180 still missing and feared buried in the rubble. Some 270,000 remain in urgent need of humanitarian aid, according to the UN’s World Food Programme (WFP). The storm’s death toll has tragically reached nearly 700 people in Sub Saharan Africa, affecting more than two million across Zimbabwe, Mozambique and Malawi. In direct response, Paramount Group and its charitable foundation, The Ichikowitz Family Foundation commissioned and funded the deployment of two specialist Search and Rescue Units from the K9 Search and Rescue Association of Southern Africa to Chimanimani, located in one of the hardest-hit regions of Zimbabwe. The four handlers, who are volunteers from the K9 Search and Rescue Association of Southern Africa, together with their two highly trained border-collies searched for the deceased in extreme conditions, in tandem with Zimbabwe’s Civil Protection Units, the International Rescue Committee and the South Africa’s Police Services. Eric Ichikowitz, Director of the Ichikowitz Family Foundation, stated: “We are very proud to play our role in bolstering the efforts of the Zimbabwean Government and various humanitarian organisations in providing the capabilities required to complete the grim task of recovering the bodies of those who perished in the disaster. The aftermath of Cyclone Idai presented all rescue and recovery teams with exceptional challenges due to the damage caused to roads and other infrastructure. “Our teams found that most of the bodies were buried under thick layers of rock and mud. Recovering bodies under such circumstances would be near impossible without these specialist dogs and their handlers. This is what the K9 Search and Rescue Units train for and I’m confident the efforts of these heroes will be remembered long after their return. We look forward to further contributing to disaster and humanitarian relief efforts in an innovative way and as best the K9 Search and Rescue Units can support. Nonetheless, our hearts remain with the people of Zimbabwe during this extremely difficult period”. One of the largest of its kind in Africa, Paramount’s K9 Academy addresses the ever-increasing need for effective training in order to carry out a wide array of tactical assignments, including anti-poaching activities, wildlife contraband detection, special forces operations and Ranger K9 handler training – all of which have garnered well-documented success rates. Paramount Group is the African-based global defence and aerospace business. It is a leader in defence and security innovation and is a trusted partner to sovereign governments around the world, providing ground-breaking products, services and consultancy, including support for peacekeeping missions. Please visit www.paramountgroup.com for more information and follow us on Twitter. Ichikowitz Family Foundation is founded upon the belief that Africa’s potential can be unlocked through education, the respect for human rights, a better understanding of Africa’s dynamic history and the conservation of its rich biodiversity. In terms of environmental programmes, the Ichikowitz Family Foundation works to promote personal, communal, and corporate best practice in matters affecting the environment, including the sustainable utilisation of natural resources, conservation of Africa’s unique biodiversity, especially building capacity and support for anti-poaching operations. Ichikowitz Family Foundation initiates, funds and runs its own projects. Please visit www.ichikowitzfoundation.com for further information.